Puddings were very popular in the 19th century, much more so than now a days. There was a great variety of sweet dishes available and many held to the philosophy that no pudding could be too rich. There was also great interest in trying foreign food to expand one’s palate and to be more educated and cultured. 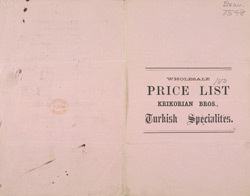 This is a leaflet for the Krikorian Brother’s Turkish speciality puddings. Dishes such as Rahat Lakoum and Figuin are featured.